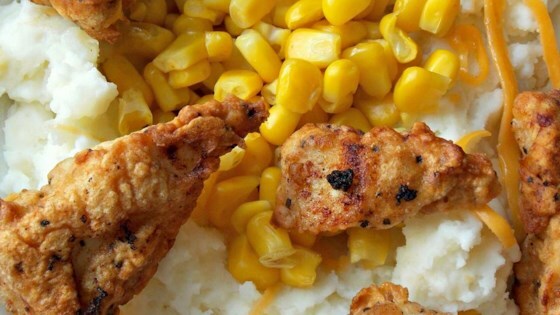 "Quick and easy comfort meal with chicken, mashed potatoes, corn, and cheese." Fry chicken strips in the hot oil until warmed through, 2 to 3 minutes. Transfer chicken to paper towel-lined plates using a slotted spoon. Cut chicken into bite-size chunks. Layer mashed potatoes, Cheddar cheese, corn, and chicken, respectively, into individual serving bowls. Chicken strips can also be baked instead of fried. I've been making this for years but I always make my own smashed potatoes, add gravy and bake my chicken with bread crumbs. Without the gravy this recipe is just missing something. Had this for dinner at a friend's house last night and it was pure comfort food in a bowl. They added turkey gravy, stuffing and even jellied cranberry sauce. It was delicious! I use frozen chicken nuggets, frozen sweet corn, and instant potatoes. This is a great, quick meal for one or two that can be thrown together after work in minutes. Everyone loves it! I was making this recipe long before they were at KFC. I used leftovers from my homemade chicken dinner for my husband's lunch for work. I do add homemade gravy too. Delicious!